The Branson Veterans Task Force will remember the historic end of WW II. Join us at the Veterans Memorial Museum on Hwy. 76, for a short ceremony to commemorate the Formal Surrender of Japan. This is the 65th anniversary of the 9/2/1945 signing, which brought an end to WWII, the single most defining event of the 20th Century. On that date, the Japanese formally surrendered aboard the Battleship USS Missouri in Tokyo Harbor. June Tillis is the BVTF chairperson for this event. 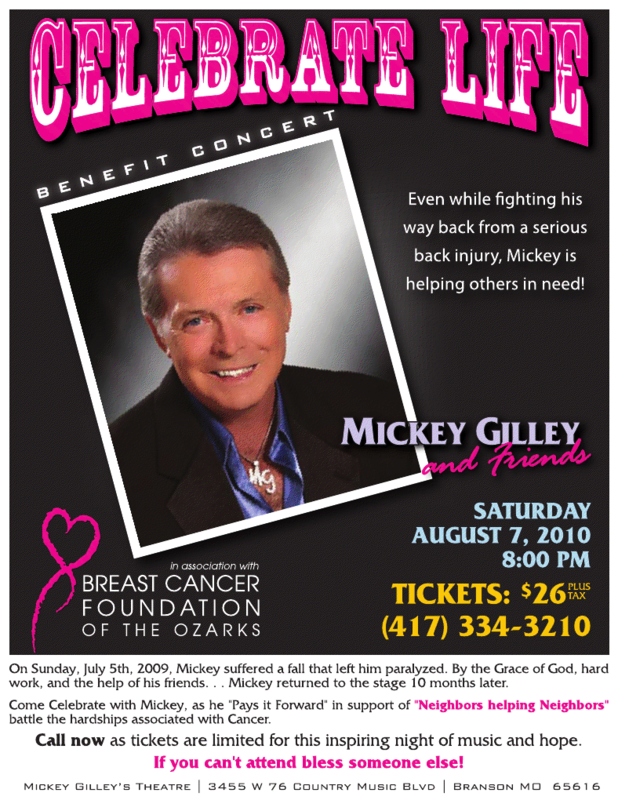 For more information contact 417-337-8387. All are invited to attend. At Branson Zipline & Canopy Tours the only experience that has the Freefall Xpress as a method of dismounting from the 100’ platform is the Blue Streak Fast Line. The other experiences are guided, low-impact canopy tours where guests traverse multiple ziplines, sky bridges, and platforms soaring through the trees and above the forest fauna. Some guests choose to combine a canopy tour with the Blue Streak Fast Line in order to experience the Freefall Xpress. Visitors to Branson Zipline & Canopy Tours at Wolfe Creek Preserve are also enjoying some unique nocturnal adventures – the Prospector In The Dark and the Ozarks Xplorer In the Dark. These evening and nighttime canopy tours have limited availability but they do allow adventurers to see the Ozark Mountains in a whole new way. As always the popular Flying Prospector Canopy Tour, Ozarks Xplorer Canopy Tour, and Blue Streak Fast Line with the Freefall Xpress are operating daily. Reservations are recommended as tours are often sold out several days in advance. Branson Zipline & Canopy Tours at Wolfe Creek Preserve is located 7 miles north of Branson on US Hwy 65. For more information visit BransonZipline.com and BransonZiplineBlog.com or call 417-561-2500. Branson Zipline & Canopy Tours at Wolfe Creek Preserve offers visitors of all ages authentic eco-adventures in the Ozark Mountains. The range of thrilling options includes a variety of guided canopy tours (inclusive guided treks across numerous ziplines, sky bridges, and platforms. Guided excursions include information about topographical, ecological and historical features.). Canopy tours include the 3-hour Ozarks Xplorer, 2-hour Flying Prospector, 2-1/2 hour Xplorer In The Dark, and the 1-1/2 hour Prospector In The Dark. The Blue Streak Fast Line with Freefall Express is a thrilling zip from the top of the property to the base with a 100-ft freefall. Branson Zipline & Canopy Tours at Wolfe Creek Station is a member of the Association for Challenge Course Technology (ACCT). The course as well as the guides certification and training meet and exceed ACCT standards. Branson, Mo…A preliminary judging committee has selected the 12 finalists for CAM’s Gospel Sing-Off on Sunday September 5th at Sight & Sound Theatres. The finalists were selected from nearly 50 very talented entries that arrived from as far east as West Virginia, north from Iowa, south from Texas, and west from Oklahoma and Kansas, as well as from throughout the state of Missouri. The 12 finalists will perform before a panel of celebrity judges as they compete for prize money that has been donated by the Branson Tourism Center. A trio consisting of Gregg Busch from College of the Ozarks, Branson songwriter Lynda Lynn and her husband Bud Lynn. The Peterson family, the locally popular bluegrass group consisting of Dr. Jon Peterson and his family. Jericho, a quartet from DeSoto, Missouri that took 2nd place last year. Connected, a duet of Steve Anthony and Darlene Jones from Branson West. The New Joy Quartet from Ash Grove, Missouri. Psalmody, a trio of Branson women (Darla Ramos, LeAnne Kelly & Teri Barry) that were among last year’s finalists. Of One Accord, a quartet from Frisco, Texas. One for All, a trio from Harrison, Arkansas that also competed last year. Matt’s Family Jam, a quintet made up of Branson’s Rolf family. Shelley Luginslad, a singer from Branson West. Zach Svoboda, a young man who recently moved here from Iowa. In case any of the finalists are unable to perform, the committee named three runner-ups to the final twelve: Sarah Clemmens of Chouteau, Oklahoma, Bethany Schroeder of Ava, Missouri, and the quartet Proclaim! Of Kimberling City (one of last year’s finalists). Branson’s George Dyer, currently performing at the Dutton Theater, will set a high mark for the contestants as he opens the show with a guest performance, before moving on to the judging panel. Last year’s winners, Sons of the Silver Dollar, will be on hand with a closing performance and announcement of this year’s winners. Aside from the competition and guest performances, the Sing-Off will feature Bob Hubbard of the Foggy River Boys as the host emcee. According to Christian Action Ministries’ board chair Jack Burke, “Selecting the final twelve was extremely difficult for the committee due to the high level of talent amongst the entries. We really wished we could have allowed all of them to perform. As the best of the best compete for the prize purse, we anticipate a truly exciting and motivating show this year and urge everyone to come out and support CAM.” Burke also added that they are still accepting business sponsors for the event, offering ad space and mentions in the event program in exchange for donations. The Sing-Off will be CAM’s major fundraiser for the year in support of the food pantry for Taney County, which provided services to over 14,000 individuals in 2009, 36% of whom were children. 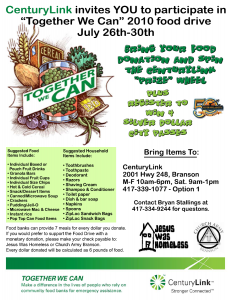 CAM has recently expanded to operate a food pantry in Forsyth, as well as Branson. The Sing-Off will be held at Branson’s beautiful Sight & Sound Theatres, home to the show “Noah-the Musical”. 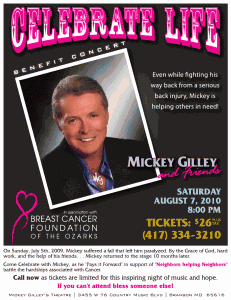 Tickets for the event are available through Sight & Sound Theatres reservations at 1-800-377-1277, at the Sight & Sound Theatres lobby box office, or through the Branson Tourism Center at 1-800-785-1550. Reserved seat tickets are a $12 donation for adults, $6 for children 12 and under. 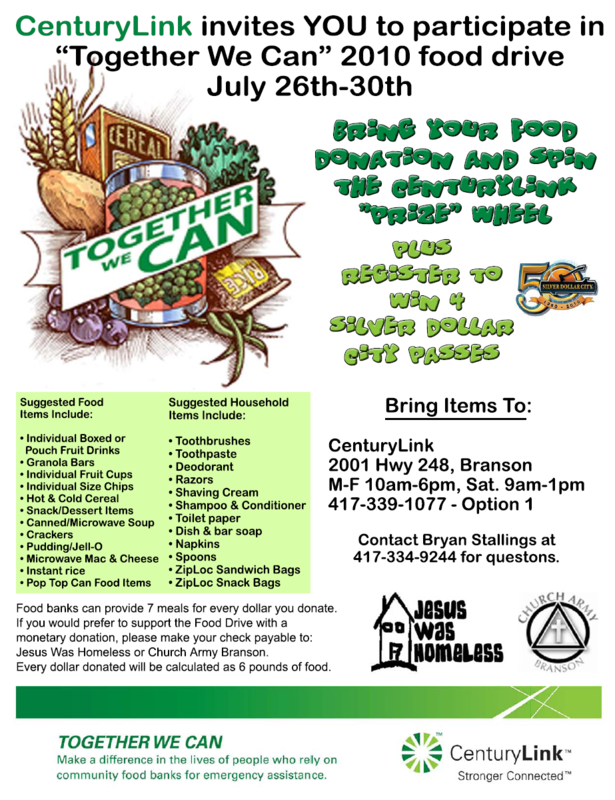 For more information, contact the CAM offices at 417-334-1157. Click image to view in larger format. You’re invited to join Big Cedar Lodge at the first annual Big Cedar Cookout on September 18, 2010 from 10:00am-7:00pm as we celebrate the fun of outdoor cooking. Enjoy a full day of tasting great food and learning cooking secrets from local and regional chefs for only $25.00. Professionals and amateurs are invited to compete for the best in seafood, pizza, veggie, BBQ, crowd favorite, and green egg open competitions. 1st, 2nd and 3rd place in each category will receive a prize and a portion of the proceeds from the event will be donated to the American Culinary Federation. For tickets call 1-800-BCLODGE. 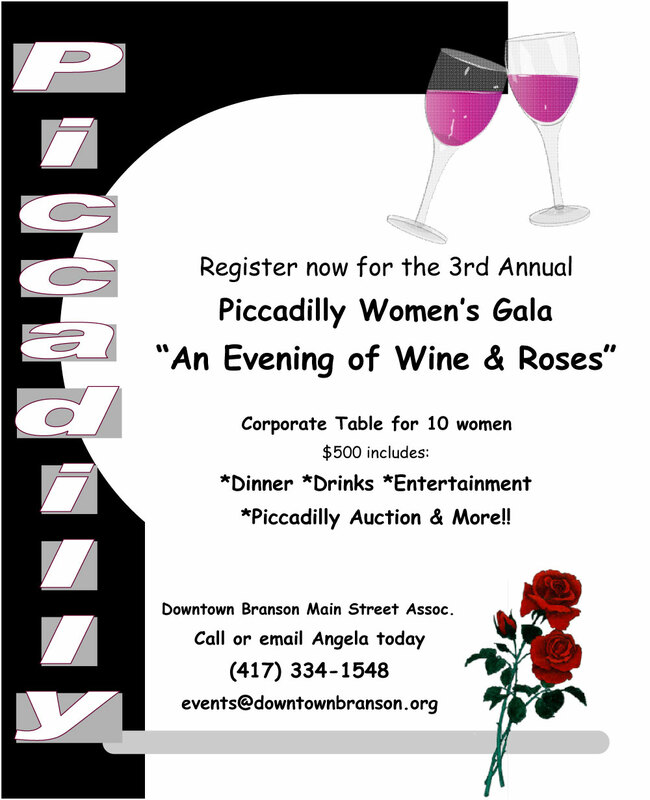 For information about participation in the competitions or sponsorship opportunities contact Jana Daugherty at 417-339-5029. FREE breakfast with The World Famous Platters at The Starlite Theatre! Beginning Tuesday, July 20th, enjoy a FREE serving of pancakes and FREE coffee with each paid ticket to The Platters Show! BRANSON, MISSOURI (July 19, 2010) – Branson Airport (BKG) and AirTran Airways are pleased to announce additional non-stop service to and from Hartsfield-Jackson Atlanta International Airport beginning September 16, 2010. AirTran will add a third Atlanta arrival on Thursday, Friday and Saturday, and a third departure on Friday, Saturday, Sunday, which presents additional connections never before available from Branson. The new connections include Tunica, Mississippi (UTM), Gulfport-Biloxi, Mississippi (GPT),Cancun, Mexico (CUN), Montego Bay, Jamaica (MBJ), and Nassau, Bahamas (NAS). Additional connection opportunities to Sarasota-Bradenton, Florida (SRQ), Pensacola, Florida (PNS) and Miami, Florida (MIA) have also been created. The following nonstop flights between Atlanta and Branson are now available to book toll free at 1-888-FLY-BKG1 (1-888-359-2541) or online at AirTran.com. Branson Airport currently offers nonstop service to Atlanta (ATL) and Orlando (MCO) on AirTran Airways, Denver (DEN) and Milwaukee (MKE) on Frontier Airlines and Austin (AUS), Chicago Midway (MDW), Des Moines (DSM), Gulfport-Biloxi (GPT), Houston (HOU), Indianapolis (IND), Nashville (BNA), and Shreveport (SHV) on Branson AirExpress. For more information or to make reservations visit FlyBranson.com or BransonAirExpress.com or call 1-888-FLY-BKG1 (888-359-2541). AirTran Airways, a subsidiary of AirTran Holdings, Inc. (NYSE: AAI) and a Fortune 1000 company, has been ranked the number one low cost carrier in the Airline Quality Rating study for the past two years and is the recipient of the prestigious 2010 Market Leadership Award from Air Transport World. AirTran Airways is the only major airline with Wi-Fi on every flight and offers coast-to-coast service on North America’s newest all-Boeing fleet. Our low-cost, high-quality product also includes assigned seating, Business Class and complimentary XM Satellite Radio on every flight. To book a flight, visit www.airtran.com. Opening its doors May of 2009, Branson Airport LLC is the first privately developed and operated commercial service airport in the United States. Currently serviced by AirTran Airways, Frontier Airlines and Branson AirExpress; additional carriers and destinations are on the horizon. Located in the heart of the Ozarks and centrally located in the Midwest, the airport also boasts a state of the art FBO, Branson JetCenter and a full service travel agency, FlyBranson Travel. 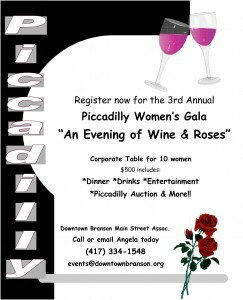 For more information on Branson Airport LLC and any of its subsidiaries please visit FlyBranson.com.